Kimmy and I are organizing a bakesale to raise money for Doggie Protection Services (DPS). They helped Kimmy find her souldog (aka doggie soulmate obvs) Sunny, and Isabelle has been making friends with all kinds of doggies by volunteering at their adoption events. I was even lucky enough to foster a boxer named Fireball for DPS for one night, and I haven’t stopped thinking about him since. If you love doggies (or if you hate doggies, but you love eating vegan desserts), come out to the bakesale and say hi, and get some treats for yourself or a friend. If you like to bake, email me if you are interested in donating some cupcakes or donuts or cookies or poptarts or whoopie pies or…is it just me or does writing blog posts make you hungry? We will have donations from Pepple’s donuts, Cinnaholic, Imagine It Bakery, Feel Good Desserts, Alternative Baking Company, Earth Balance, Miglets, Raw Daddy Foods, and many local vegan home bakers. Everything will be vegan, and there will be gluten-free options as well. 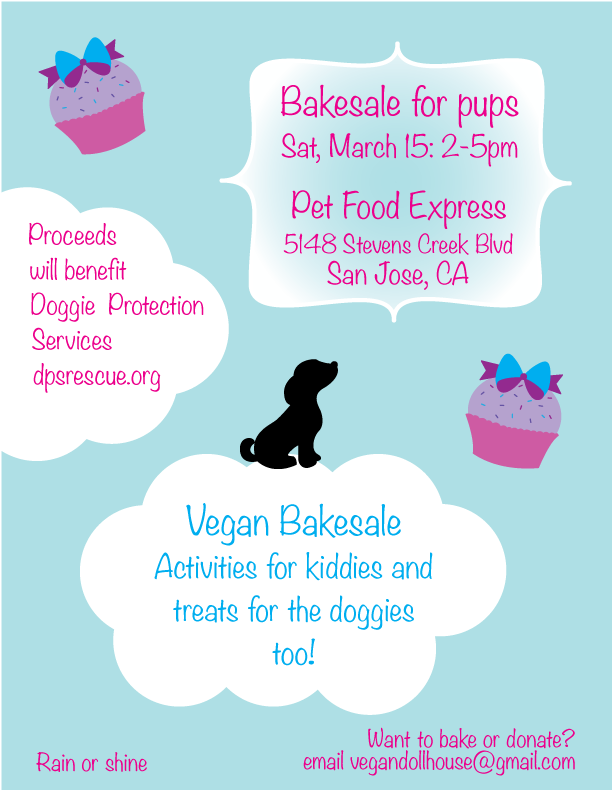 The bakesale will be held from 2-5pm on Satuday, March 15 at Pet Food Express in San Jose. The address is 5148 Stevens Creek Blvd., San Jose, CA.